Looking for a simple refreshing summer salsa? This is it! 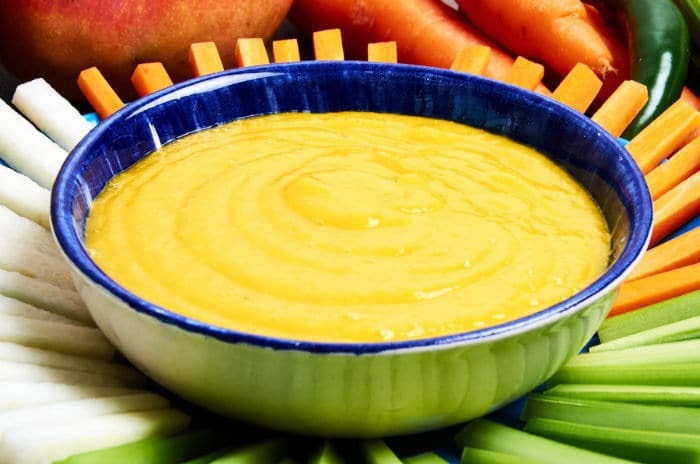 Take advantage of mango season and prepare this raw mango salsa. We like to serve it with a vegetable platter or cocktail shrimp. It’s really great with crunchy jicama. We recommend it for cold dishes that needs some kick. Sharp serrano chile and the tangy lime provide counterbalance for the sweet mango. An uncooked salsa that couldn’t be easier to prepare. 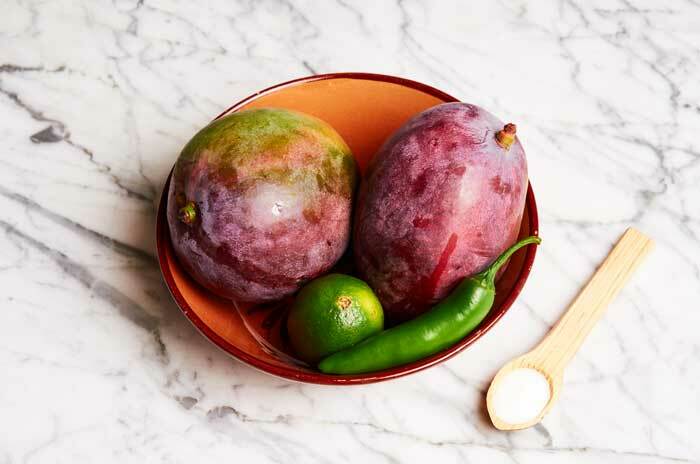 Choose just ripe mangos for this salsa. Give them a gentle squeeze and if they give a little they are ripe. If they are hard when you give them a squeeze they are not ripe and if they are mushy they are too ripe. Any variety of mango works well for this recipe. We used the Tommy Atkins variety which is common in Mexico. Ingredients for your raw mango salsa. We prepare this salsa with 1 whole serrano chile, seeds and all which gives it a nice kick. You can reduce the heat by removing the seeds. If you only want a hint of chile heat remove the seeds and use only 1/2 of the chile. 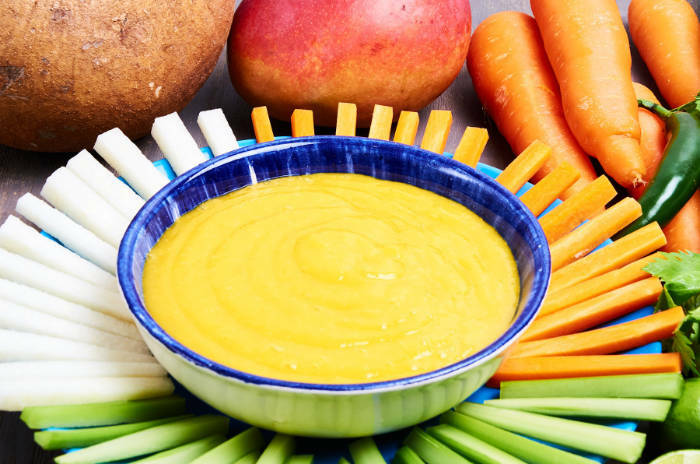 Simple, refreshing raw mango salsa that is great as a vegetable dip or with cocktail shrimp. 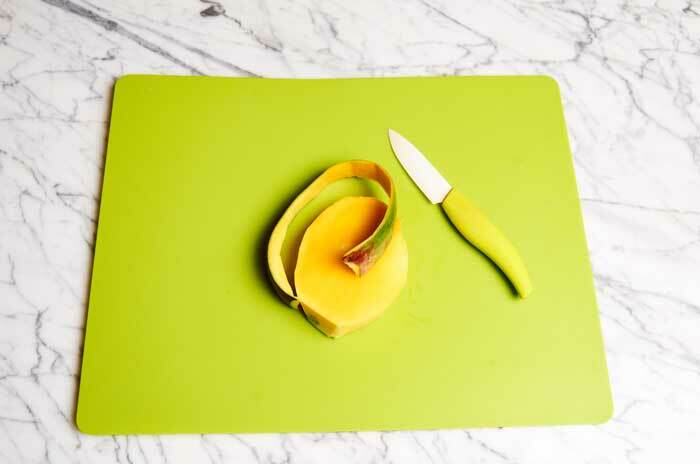 Sharp serrano chile and the tangy lime provide counterbalance for the sweet mango. Remove the meat of the mango (see tutorial below). Discard the pit and skin. Add the mango, serrano chile, salt, water and the juice from the lime to your blender. Blend until smooth. If the salsa is too thick add 1 tablespoon of water at a time until you reach the desired consistency. This salsa is best served immediately. It will keep in the refrigerator for two days but the flavors and texture are best when it is served fresh. Serve with a veggie platter or cocktail shrimp. It is also great on spring rolls. It's great dip for serving at parties. You can substitute jalapeños for the serrano chile. Jalapeños are milder. Add a couple of strawberries when you blend to make strawberry mango salsa. Let us know what you think of this recipe in the comments below. Provecho! Mangos are not the easiest fruit to get the meat from. They have a large pit in the middle that’s difficult to cut around. 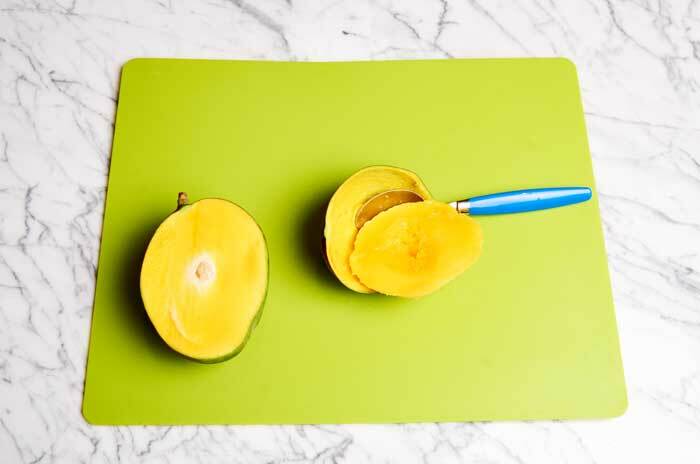 This isn’t the prettiest way to cut up a mango but it is the way that allows you to get the most fruit. Since the mango will be blended we don’t need to worry about pretty. Lengthwise, cut off 1 side of the mango. Scoop the flesh out of the skin with a tablespoon. Do the same to the other side of the mango. Be careful when you cut. Mangos tend to be slippery. After you have cut off both sides of the mango you are left with the pit that still has some meat on it. Use a paring knife the cut the remaining fruit off of the pit. Discard the skin and the pit.